Sending those undead freaks back to Hell. Literally hundreds of zombie themed video games exist on the App Store, the majority of which task players with mowing down hordes of flesh eating monsters. After years of doing essentially the same thing, seeing yet another zombie title should make us groan with undead boredom. Thing is, splattering a zombie's brains remains an enjoyable pastime. Case in point, Call of Mini: Zombies, a standard looking third person shooter with one goal: kill those rotting freaks before they return the favor. Each mission throws you into a man against zombie fight for survival, where you must destroy a certain number of creatures to proceed to the next stage. To give you an edge, the developers scatter boxes through the locations (a deserted town, parking garage, to name a couple), filled with ammunition and money, clearly the most important facet of the game. Score tons of loot, and you'll be able to purchase the game's 13 weapons, a list that includes a P90, AK-47, an RPG and Winchester 1200, then upgrade those guns to boost damage, fire rate, accuracy and ammo. 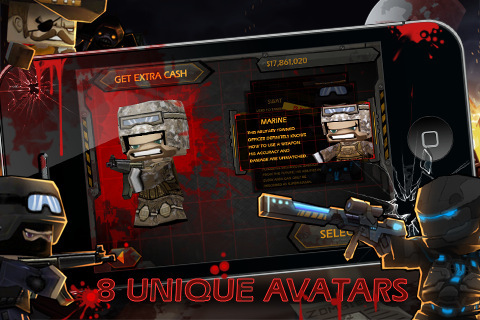 In addition, Call of Mini features armor as well as eight unique characters with individual strengths, from the Nerd to the Doctor, Cowboy and Marine. Thing is, most of this stuff costs a lot of money, and it'll take hours to accumulate enough dough to buy something like a Gatling gun. That's where the in-App purchase rears its decayed head. Coughing up real world cheddar helps you replenish the virtual bank account. Thankfully, the prices are reasonable, where $0.99 nets you $500,000, and $19.99 equates to $16,500,000, with other amounts in between. You can do plenty of damage with just a couple bucks. On the flip side, mo money, mo problems. Call of Mini: Zombies is already somewhat repetitive, since it forces you to revisit the same maps. That said, we took great pride in grinding to earn the AK-47. Buying all that stuff at once, however, cheapens the experience, largely because the game's so shallow. There's no online/local multiplayer or survival mode to speak of. Spending millions to unlock the best gear right away feels like cheating. On that note, Call of Mini: Zombies offers plenty of gun-toting thrills for a buck. We certainly don't regret downloading it. At the same time, we wish it had more meat on its bones. 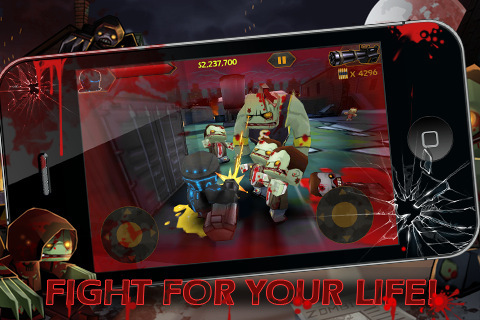 What's Hot: Enjoyable zombie blasting play, 13 upgradeable weapons, eight different characters, solid dual stick controls. What's Not: Not enough modes, very repetitive, takes a long time to naturally accumulate cash, unimpressive audio.